BASSE-NAVARRE Lower Navarre; BENAPAROA (Basque). The part of the Kingdom of Navarre that lay north of the Pyrenees; in the united Kingdom it formed the district of Ultrapuentos, beyond the passes. After 1512, when Ferdinand II conquered Spanish Navarre, Basse-Navarre was all that was left of the Kingdom in the hands of the Queen of Navarre, a member of the French family of Foix, and her husband, who belonged to the House of Albret. In 1514, after attempting to recover their Kingdom south of the Pyrenees they lost even the lands north to Ferdinand’s troops. Their son, Henry II, attempted to regain the whole Kingdom in 1521 but failed, but in 1530 Spain withdrew from Basse-Navarre and Henry was restored to his petty Kingdom. His French lands in Foix, Béarn and Albret far exceeded in area the lands that gave him his royal title. His daughter, Jeanne, married a Bourbon, and their son, King Henry III of Navarre, became Henry IV of France in 1589. Basse-Navarre was added to the royal domain in 1607, though the decision was only made effective against local resistance by a campaign in 1620. In the Ancien Régime it was linked with BÉARN, and there were several changes during the 17th and 18th century in military and civil administratation. 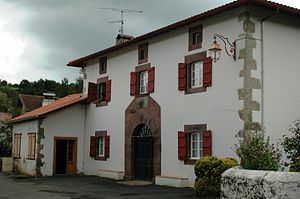 Basse-Navarre is in the Department of Pyrénées-Atlantiques and, as Benaparoa, is today one of the three territories that make up the French Pays Basques. This entry was posted in France, Spain and tagged Albret, Ancien Régime, BÉARN, Kingdom of Navarre, Navarre, Pyrenees. Bookmark the permalink.